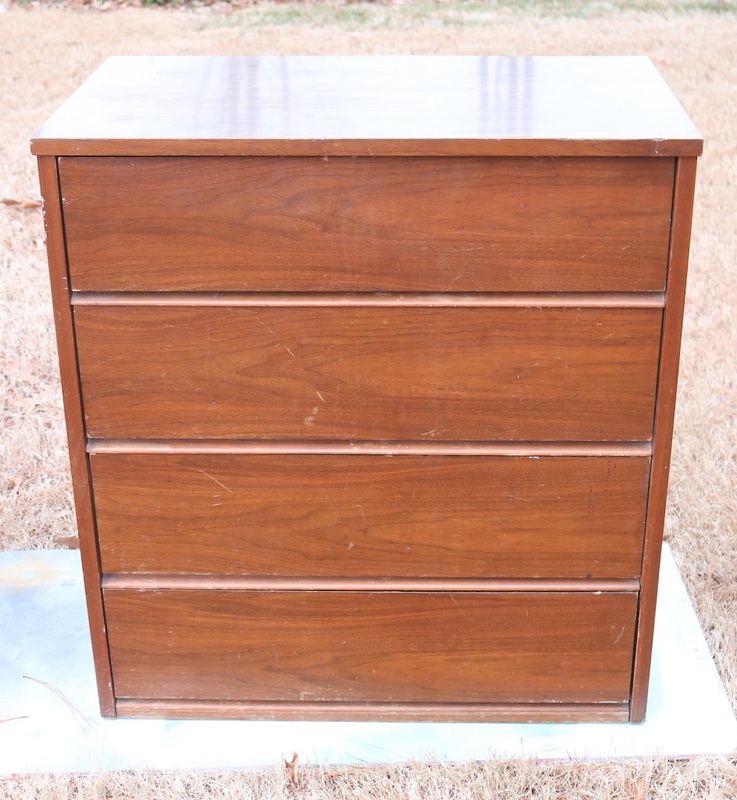 Such was the case with this mid century walnut Dillingham dresser…. And of course the finish was a little worn and tired looking and needed some freshening. First I tried a little Restor-a-finish…. You can kind of see the difference…the right side has been wiped down with Restor-a-finish. It helped a tad but in the end I scrubbed it down with mineral spirits and steel wool and applied 2 coats of tung oil finish…brightened it right up and blended all the scratches and wear…after all it is a 50+ year old piece…it’s gonna have a few nicks and dings. But again, nothing terribly glaring. Even though the issues were relatively minor, I hesitated to sell it. I considered painting the sides to disguise the biggest issue…the broken corner. Enter my kid! Matt absolutely LOVED it and wanted it for an entertainment cabinet! 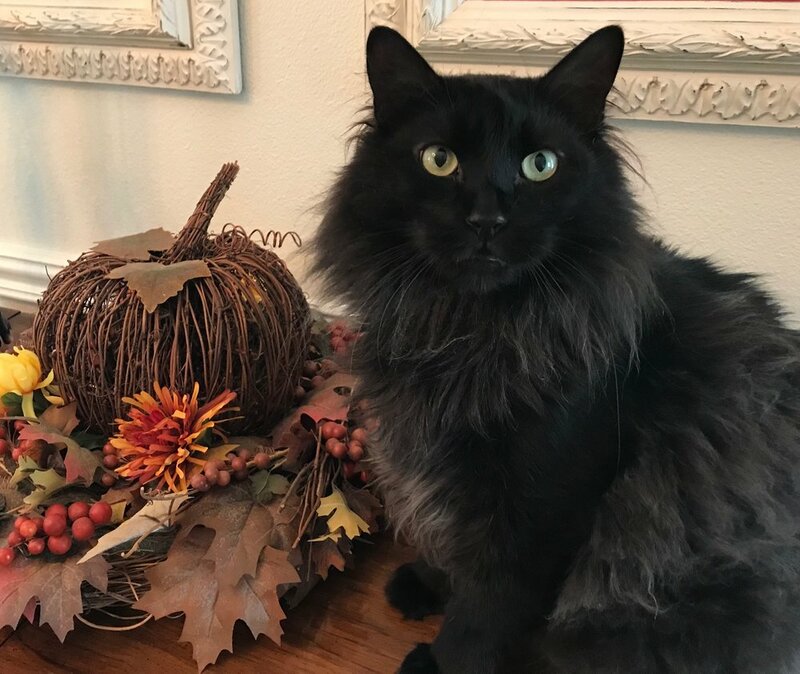 The dark walnut matches his vintage Lane tables perfectly and like me he has a real affinity for MCM pieces. So I went to work modifying it for his needs..specifically he needs a place for his turn table. 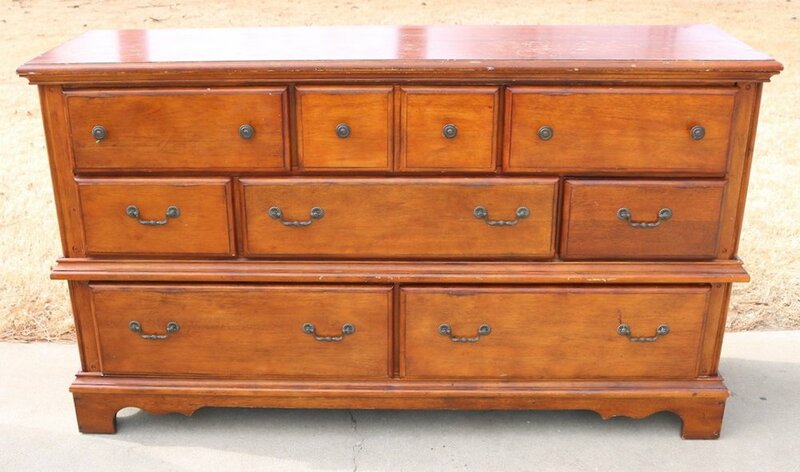 So…how to modify this dresser without changing it too much. I decided to make the bottom two drawers one deep drawer. That entailed removing the face front of the middle drawer and attaching it to the black face frame and bottom drawer…creating what appeared to be two separate drawers…but is actually just one deep drawer. Confusing I know…let me see if I can show you what I mean in pictures. First I had to cut the face frame in half to detach it from the cabinet. Since it is a laminate material, I knew I needed to tape it first to keep it from “splintering.” ALWAYS tape laminate before you cut it and draw your cut mark on the tape! I have a small Dremel that has similar functions but this little guy is pretty heavy duty…and it worked like a charm! Next I used my Kreg jig and glue to attach 1x2 pieces of oak to both edges of the face frame. The drawer fronts and face frame only over lapped by about 1/8”…attaching the oak allowed me to secure the face frame to the drawer fronts with glue and screws. We used a hole saw to cut a hole in the back of the cabinet to feed electric wires through. That was pretty much all the modification this dresser needed to turn it into the perfect entertainment cabinet! In the photos you get a peak of a few of the changes Matt has made to his house since he bought it a year ago…the painted fireplace I shared here and the new tile I haven’t shared yet. I have promised for A YEAR to share a few of the projects he has completed on his house…he opened up the entry, painted his kitchen cabinets and installed glass cabinet doors, built open shelving in his kitchen and laid new tile in the entry and around the fireplace. He has even built a little storage shed! I am so proud of his “projecting” so while I was there taking pictures of his new entertainment cabinet, I snapped a few of his entry and kitchen and I PROMISE to share those next week. If you remember, I had a booger of a time with my living room couch purchase. I ended up purchasing the “Michael” by Younger Furniture. A year later, I love it! I felt at the time I was breaking my cardinal rule of going “trendy” on a big ticket purchase. Truth is, it is a chameleon…it pretty much changes with whatever I throw at it. When I first got it, I had my Christmas decor up…and it looked great. Fall…oranges, yellows, greens, browns…wasn’t sure it was going to cut it. I love that it can take any color I throw at it! After the holidays I am considering transitioning to another color pallet in the living room…maybe a navy blue or olivey green. Don’t know yet but I know that whatever I do, the couch will not be a factor! And it really did turn out to be quite comfy. Which brings me to the point I have often made…on big ticket purchases, stay neutral. I love the deep green and vibrant blue velvet couches. Beautiful! And if you KNOW you will love that couch for years to come, I say go for it. But if you just aren’t certain or you know you will want to regularly change up the look of your decor, stay neutral on the “big ticket” items and let your pillows, accent chairs, rugs, wall decor, throws, etc dictate the decor. Those elements can be easily and relatively inexpensively changed to make a big impact on the feel and look of a room! Why would she even mess with something so hideous? Because I knew I could make them pretty…that’s why!!! Truthfully these pieces didn’t have a lot going for them…but what drew me to them was the really cool hardware and they are pretty sturdy. Ugly, but sturdy! The hardware is obviously “reproduction”…made to look like the hardware of years gone by. They aren’t REAL flush mount ring pulls, but they are real brass so I knew with a little scrubbing, they would shine right up! But it was in good shape! Rather than use wood filler I decided to add a little trim piece to the bottom. Glue and trim nails…simple! The trim covered the chipped areas and beefed up the base a tad. The minor “bubbling” on the particle board sanded smooth. The bottom of the drawers had that “fake print” thing going on but they were in great condition. Ugly, but solid and sturdy. I decided to disguise the “cheaponess” with paint. First I removed all the hardware and spend a few hours scrubbing it. Again, I have no deep dark secrets for easily removing years of tarnish on brass. SOS pad and brass cleaner…and a lot of elbow grease! I Kilzed the entire dresser…even inside the drawers. Again, I am kind of obsessed with the white lacquer finishes especially with bright brass hardware. The repaired sides painted beautifully! Told you I could make them pretty! Remember the MCM chest of drawers I featured here? I finally got the brass cone hardware from China…worth the wait! A mid century chest of drawers makeover...the reveal! When last we spoke, I shared a little “step by step” tutorial for repairing and prepping this “less-than-desirable” chest…. I can not stress enough the importance of “prep work” on any project. Again, if you don’t take the time to make repairs and properly prep (regardless of whether it is a dresser or a wall or a floor) all the “pretty” is going to be wasted. Make proper repairs, sand patches smooth, use the right tools and materials! Do the repairs and prep or you are wasting your time and resources making it pretty. I primed the cabinet of the chest with Kilz. That is usually my go-to primer since it sands smooth and holds up well. Primer is a SUPER important step on most paint projects…unless you are chalk painting! Since this was a relatively small project I used the spray Kilz…one can. TIP: I know a lot of paints SAY they are a “paint and primer” in one…I may eventually change my tune but I don’t believe them. I ALWAYS use a primer…always! After the Kilz had dried well (usually overnight but several days is best), I sanded it smooth with 220 grit paper. …no biggy….I just filled them again, let it dry, sanded smooth, spritzed on a little more primer and then sanded it again after that had dried. Tack cloth…it is an absolute necessity on any paint job. I see tutorials all the time that recommend wiping the piece with a damp cloth or even mineral spirits. Forget about it! USE TACK CLOTH! It will pick up the finest grains of whatever and will make a huge difference in the final look and feel of your paint job! I’m kind of obsessed with white lacquer these days. i just love the high gloss finish. Spray paint is always a great option for smaller projects and you can find a multitude of colors and sheens! Just make sure you use a quality brand! You can also brush and/or roll alkyd (oil based) or latex (water based) paint. ALWAYS use an additive and use a high quality brush and 4” foam roller to apply the paint. Pay attention to the manufactures recommendation for temperature and application…it matters! Regardless of whether you use a spray paint or lacquer, latex or oil, always apply 2-3 THIN coats, allowing dry time as recommended. Thinner is better. If you try to get a one coat finish, you will likely be disappointed and make a HUGE mess! Spray, roll, and/or brush on the paint…a thin coat…let it properly dry, lightly sand the boogers AFTER it has properly dried with a fine grit paper (IF needed), tack and recoat. Regardless of whether you need to sand between coats, always use tack cloth before applying additional coats. I usually apply at least two coats and sometimes three. Most paints do not need a top coat but if your piece will be getting a lot of use, I recommend a light coat of polycrylic. Polyurethane is some good stuff but it tends to “yellow” so polycrylic works great. You may have noticed one little missing element. The hardware! Why? Well because I didn’t pay attention when I ordered new brass cone knobs and they are coming from CHINA!!! So I should have them someday…maybe…who knows! The hard work is done…knobs are no biggy! Dry time…IT MATTERS. I cringe when I watch DIY shows and they immediately stage all the pretty pieces they just painted. There is a huge difference between “dry to touch” and “dry to USE.” Truth is, paint and finishes need time to cure before you put all your pretties on it. You can move it in place, but give latex paint AT LEAST a week or two to cure and oil based paints a good 3-4 weeks. Otherwise you may find that your heavy lamp or knick-knacks will stick to the finish or leave a mark! Again, I know this sounds like a daunting and time consuming task…but if you take the time to do it right, you will have a piece that will last another lifetime and one you will be proud to use in your home! Next week I hope to share my bathroom remodel. In the meantime, you can check out Cristina’s master bath…it will knock your socks off! A mid century chest of drawers makeover...Part one! While my master bathroom remodel is still progressing (yea!) I finally found time to tackle an amazing mid century dresser I found! This chest of drawers was pretty shady. Nasty finish, chipped veneers, busted veneers, mismatched hardware…just not something you really want in your home! 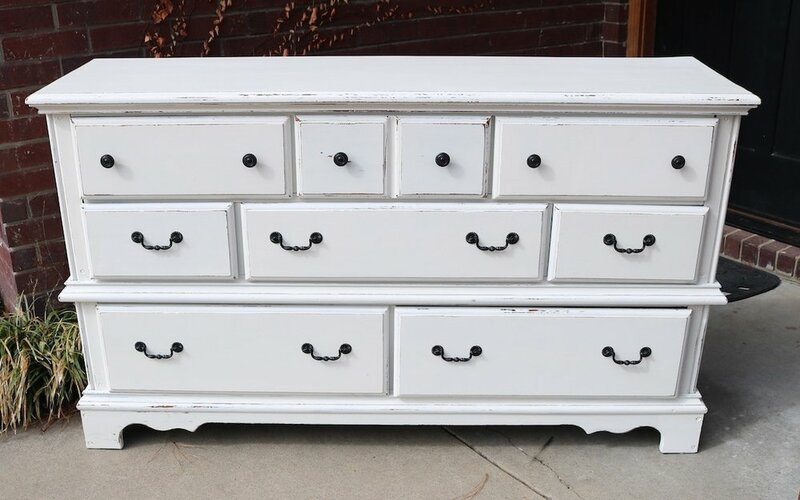 It had many of the problems you may encounter with old pieces so it is the perfect project to share a little “step-by-step” tutorial on turning a trashed dresser into something you will want front and center in your home! This is NOT a huge issue. I can not stress enough the importance of making proper repairs to any piece before you start making it pretty. Glue and clamps people…NOT silicone, not screws, not nails…just plain ole’ wood clue and clamps. This one really wasn’t too bad…there have been some I had to completely tear apart and rebuild! Kinda necessary if you want your drawer to not be all whomper jomped. Again, no biggy. You can buy slides online but I used some scrap 1/4” plywood and scrap trim to make one. Again, glue and clamps and good as new! TIP: If you have a drawer with wood slides that seems to be difficult to pull out, try rubbing a wax candle on the wood slide. If you have a metal slide, make sure it isn’t bent…if it is, just take a pair of pliers and manipulate the metal. Also, if you find the drawers to be a tad smelly, first wipe them down with ammonia and water, then spritz them with vinegar water and let them sit. Truthfully, I have found a few that smelled no matter how well I cleaned them….in that case I taped off the fronts and painted the interior and exterior of the drawer with Kilz and latex paint (here is an example! )…sometimes you have no choice! Next up chipped and scratched veneer. A lot of the older furniture is veneered. If it is chipped or scratched, take the time to remove any loose veneer and repair it with a little wood filler. The first few coats don’t have to be pretty…you just want to make sure you fill all the boo-boos well. Don’t rush this process…it may take two or even three coats to get a smooth repair! In this case it took two coats (sand between each coat) and a lot of sanding with a fine grit paper (220) to get a smooth repair, but in the end it will be worth all the effort! I have found that after I prime and sand, I can often see how well the “patch” will look and can add more filler and do more sanding if needed. If it looks and feels rough after priming, it’s going to look bad with paint…so do a little more work on it after the primer if needed! My plan originally was to strip and oil the top since it is a walnut veneer, but I did a number on it dragging it out of my truck…so repair and paint it is. I would like to stress (again!) the importance of sanding and FEELING! You want it smooth to the touch. If you can feel it, you will see it when you paint it! So sand it smooth. The veneer on the drawer fronts were in mint condition…the finish just looked old and “muddy.” I removed the mis-matched hardware and then stripped the old finish (using this process). It took me less than 30 minutes to strip all four drawers. The two on the right have been stripped…the two on the left have not…as you can see, they weren’t THAT bad, but this quick step brightens the color and really allows the grain to shine. On veneers it is important to use chemical stripping as opposed to sanding. Veneers can be very thin and if you sand through the veneer there is no salvaging it…you will have to putty and paint! After stripping them I applied three coats of Formby’s tung oil finish. 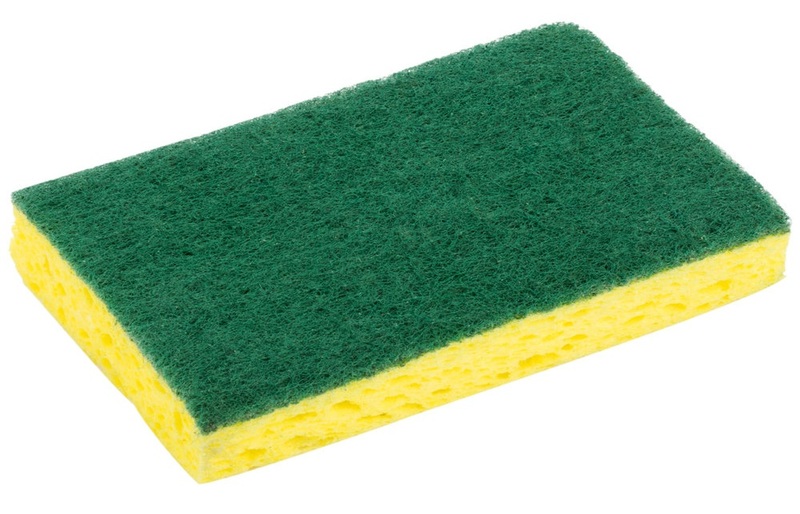 I love this stuff and it is my “go-to.” No stain, just a clear finish! I also stripped and oiled the legs since they were in pretty good condition. Same process, same finish. If your drawer fronts have MINOR chipping like this one did, I would suggest carefully removing or glueing any “loose” veneer (I use a toothpick to slide a bit of glue under any loose veneer and wipe the glue residue with mineral spirits) and then apply the finish. As my daddy use to say, you will never notice it on a passing train! Any time I can salvage and feature a beautiful walnut veneer, I do! Again, my apologies…this will have to be one of those “to be continued” posts. We had rain and a cold front roll in (yea! it really is fall now!) and since I don’t have a nice cozy shop I am at the mercy of the elements. Priming, paint and reveal will have to wait until next week! This process may SEEM daunting and time consuming but in the end it is all worth the time and effort to bring these sturdy old pieces back to life! Take your time and do it right and you will have a piece fit for another lifetime of use! Hopefully next week you will get to see the results of all this prep work! 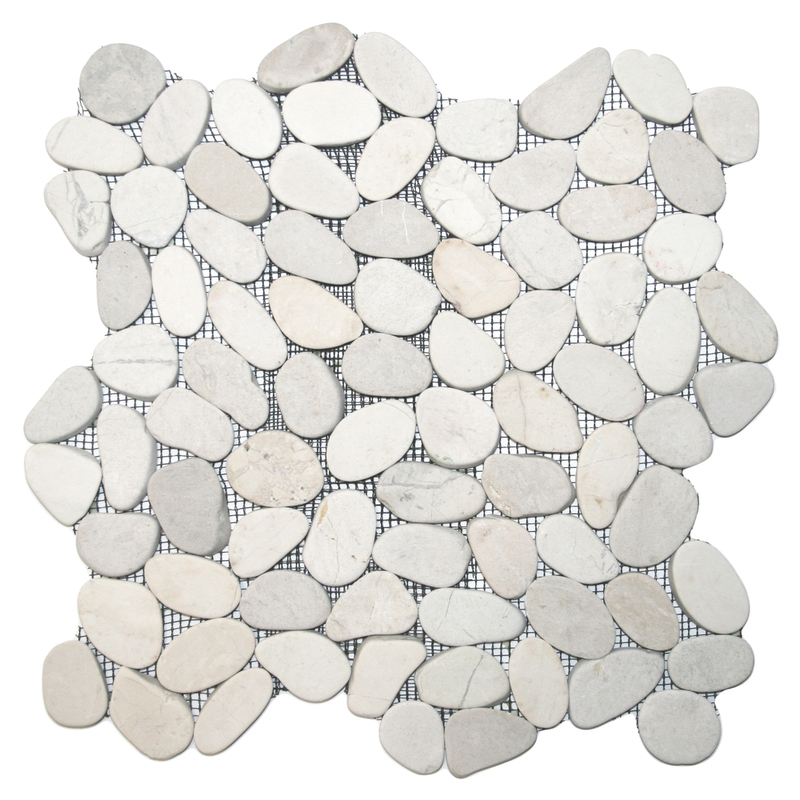 In my quest to make changes in my master bath, I FINALLY decided on the a sliced white pebble tile for the shower floor and niches. One decision down...too many more to go!!! When I first remodeled the master bath, I did a glass tile backsplash on the vanity...I like it, but honestly I am no longer in LOVE with it. And to be honest, I think the glass tile backsplash craze is running it's course. In other words, it is a fad that is fading...at least in my opinion. Besides, it had brown in it and I am moving away from browns! Since it is such a tiny bit of tile, I decided to change it up a bit. AGAIN WITH THE DECISIONS!!!! But I got to thinking...I love live edge wood countertops, coffee tables, benches..."live edge" wood anything is just beautiful! If you don't know what I am talking about, google it! Why can't I make a "live edge" tile backsplash? The pebble tile I picked out for the shower floor has a "live edge." In other words the pebbles are laid on the sheet in such a way that the edges of each section of tile are "natural." This vendor carries a tile border but it is only 4" tall. You can also remove each individual tile from the netting and place each individually...nah, way to much work for me! Since I have a small backsplash, I cut each 12x12 sheet of tile in half with a wet saw. I only needed 3 sheets of tile...less than $40! Then I had to set it on the vanity for a few days to see if I was really going to like it! Since that tore up the sheetrock AND the new tile wasn't going to cover the entire section I removed, I had to do some sheetrock repair. If you decide to cut the sheetrock down to the studs, here is a super simple way to "patch" the section you remove! I didn't have to do any patching, but the basic rules apply...mud, sand, texture and paint! Apply a coat of mud, let it dry overnight, then sand. Then another coat, let it dry and sand again. I can not stress the importance of sanding sheetrock mud smooth...FEEL IT! If you can feel it, you are going to see it when you paint it! Sand, feel, sand, feel! I used an 80 grit paper. You are better off sanding too much and having to apply more mud! This product is one of my favorite little DIY "hacks." Sheetrock texture! If you have properly sanded, this stuff will blend old with new! Just make sure you shake it WELL and always test spray it before you start spraying your wall. On more than one occasion I have had to wipe off the wall and start over because the texture came out to thick or too thin...so take time to test it before you start spraying it on your wall! The knob adjusts for different "textures." Follow the directions on the can. Let the texture dry WELL before you paint! So, on to the fun stuff...tiling! First, this is a "natural" stone tile (if you don't know if your tile is a "natural stone" vs. ceramic or porcelain tile, ask!) The very first thing you want to do is seal it with an "impregnator sealer." Ask...they have it at most home improvement and tile stores. Super simple to apply...brush it on...let it sit for about 5 minutes, then wipe it with a clean cloth. I would suggest doing this before you cut it with a wet saw, but definitely before you install it and grout it!!! The net backing is what is holding all the little pebbles in place so you don't want to get carried away...just trim the netting away from the edge that will be exposed! I used a premixed tile mastic. Mastic is for small tiles...thinset for large tiles. Always use the adhesive and trowel recommended by the tile manufacturer. I coated the back of the sheet with mastic using a properly sized trowel. I used a small craft brush to apply mastic to the edge pebbles...it is okay for the mastic to "squish out" between the pebbles a tad, but you don't want it squishing out on the edge pebbles...I kept Q-tips on hand "just in case." Just make sure you get enough mastic on the back of the edge pebbles for good adhesion. TIP! Never set a tile backsplash directly onto the countertop...always use spacers and then after you grout you will run a small bead of caulk between the backsplash and the top. In this case I wanted a very small space so I used dimes as spacers! Thank goodness we keep a change jar and I was able to fish out a few bucks worth of dimes! Let the mastic dry over night before grouting! Now this is where I tell you to "tune in next week" for grouting instructions. Why? Well because as I mentioned I needed 3 sheets of tile to complete this task and I only had the two I ordered as samples. So now I am waiting on the other sheet to be delivered so I can finish this little project. I know...it's annoying to get engrossed in something only to be told "to be continued." But I promise...next week I will share how simple it is to grout, seal and caulk the new tile backsplash. Until then, I will share something I promised last week I would share! I shared last week that I have been in "dresser mode" recently. I currently have FIVE dressers and chests sitting in my garage ready to roll! Last week I took a dresser in and it sold that day! I think it has been in my garage for over 6 months...I just never took the time to work on it. It wasn't in horrible shape...just a really bad paint job (you could see all the brush strokes) and the hardware was pretty chippy! I didn't change it up too much...KTSP...kilz, sand, tack and new oil based high gloss white! The hardware got a little makeover...I primed it with metal primer and sprayed them with high gloss black lacquer. Again, not a huge change but enough to give it a new life! Maybe next week I'll share another one...if I can dig them out of the garage! Well, that and the "to be continued" of the tile saga! Some of the simplest "befores" turn out to be my favorite "afters." Which explains why I often don't have decent "before" pictures...I think "oh, that's no biggy" and dive right in to giving them a simple little makeover. Then they turn out so stinking cute I wonder why I didn't take time to take "before" pictures. They are a reminder of why do this blog...to show you how easy it is to take a simple, boring, out-dated, dark piece of furniture and turn it into something you will want in your home rather than in your yard at the next garage sale! We DIYers live for those hidden treasures...pieces of furniture that people want to get rid of... they drop them at their local thrift store or sell them for pennies in garage sales or just set them out on the curb...we take them home, clean them up and work a little DIY magic. The worst...you live with the ugly, dark furniture because you can't afford to replace it! I get it...you paid a small fortune for your "matchy-matchy" bedroom furniture so you can't bring yourself to get rid of it. I've shared "makeovers" hundreds of time...too many times to link ALL the pieces I have "upcycled" over the years. But I would bet money you still have a few pieces lurking around your house that serve a purpose or are "family heirlooms" or you paid too much to get rid of it...so you just live with it. Don't fret...take the plunge...buy some primer and some paint AND CHANGE IT! This shelf was your typical Target cheapo...dark finish...no I did not take a picture of it "before." Honestly, I think it was a piece someone left at the apartments so I loaded it up and brought it home. I removed the back panels...primed and painted the frame and shelves with one of my "sample" pots of white (KSTP). I painted the back panels with a sample pot of teal and then reattached them. Super simple and too stinking cute! This little bedside table came with a set I bought at an auction. Someone bought the dresser, chest and bed but didn't want this little table. ....again, SUPER SIMPLE and so stinking cute! This old oak dresser...the finish and the little applique' really dated the piece. I popped off the appliques using a chisel...lift carefully...chances are they are applied with a little bit of glue and a few tiny nails. Nothing earth shattering on any of the pieces...just super simple little makeovers that updated the pieces and gave them new life! Walk around your house...what simple little piece can you haul out to the garage and work a little "DIY magic." Trust me...if you don't like it when you are done, you won't get any less for it at a garage sale!